So before you start watching how-to videos online or asking your social network contacts for advice, here’s our five top tips for planning home improvements more carefully. Over and above all of these though is this: Know what you are doing. Hopefully you have past experience, but if not, make sure you’ve checked a DIY manual or website, practised on some spare waste materials, and call in a professional if you’re still not confident in tackling the task alone. 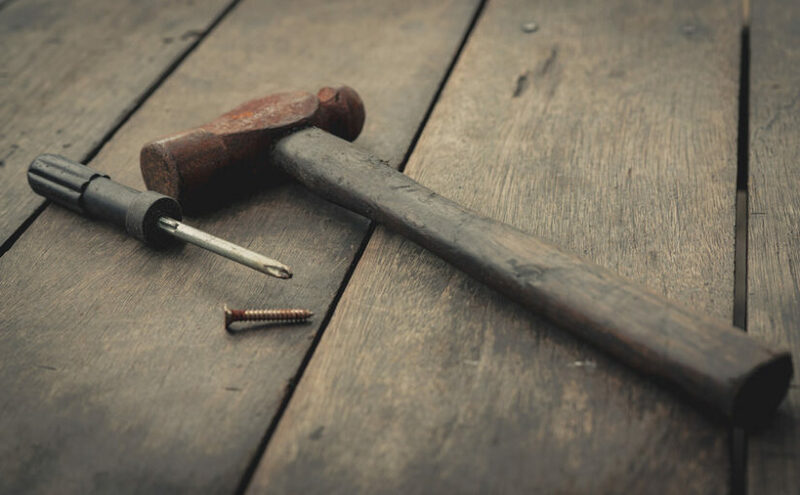 Decent tools make the world of difference, whether it’s a sharp chisel, the right size and shape of screwdriver head, or a mains-powered masonry drill instead of a cheap cordless drill. You don’t have to buy everything at full price – if it’s something you’re only likely to use once, it might be worth a trip to your local tool hire shop instead. Like tool hire, skip hire gives you access to something you don’t normally have – in this case, a hired domestic skip with plenty of capacity for waste materials. Don’t underestimate how much waste a DIY project can produce, especially if you’re replacing old furniture or stripping wallpaper. With domestic skip hire starting from 4 cubic yards, you can hire a skip big enough to take all of your domestic waste, but small enough to fit on your driveway or by the kerb. Pets and home improvements don’t mix, so have a plan to keep your cat or dog out of the way, if you have one. Remember too that just like fireworks, the loud noises of powertools can spook some animals, so again decide whether you need to get a friend or neighbour to take your pet to their house for a day or two. Even having someone take the dog for a walk for an hour while you get the noisiest part of the work done can help – and might also spur you on to get the job done faster! Once you hire a domestic skip, necessary powertools and buy in the materials you need, make sure everything is ready to go. Check tools are working and in a good state of repair, organise your materials so you can grab the next thing you need easily, and clear a route out to your skip so you can throw waste materials away as you go along. An organised work space not only makes it easier, it also makes it safer – and filling your skip as you go along means you keep your space clear of debris. No matter how organised you are, there will still most likely be some cleaning up to do, so factor a little spare capacity into your skip hire depending on your project. Remember that when cleaning up, you might not only have excess materials to dispose of, but also the cleaning materials themselves. That might include mountains of newspaper you used to catch paint drips, kitchen roll and cloths/rags, or even old dust sheets that have seen their final home improvement.